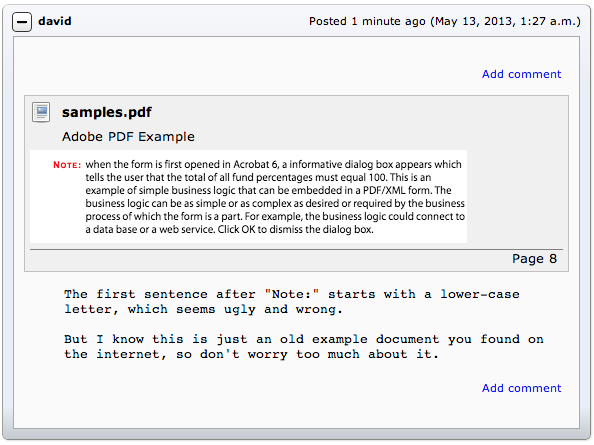 A little while ago, we announced that we were building document review features for Review Board. This will be available as a commercial extension in order to help fund the project. Of course, once it’s ready, RBCommons customers will get it as part of their normal plans. I’d like to show off a bit what you’ll be able to expect. Since Review Board 1.6, you’ve been able to attach arbitrary files to review requests. For anything except images, the only way to view them was to download them. You could add general comments to these files, but for large things like a document, you couldn’t use the direct commenting that we’ve all come to love from the diff viewer. 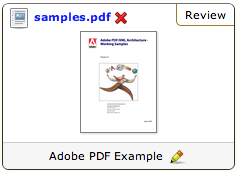 With the PDF Review extension, when you upload a PDF file, it gets a thumbnail and a “Review” link. 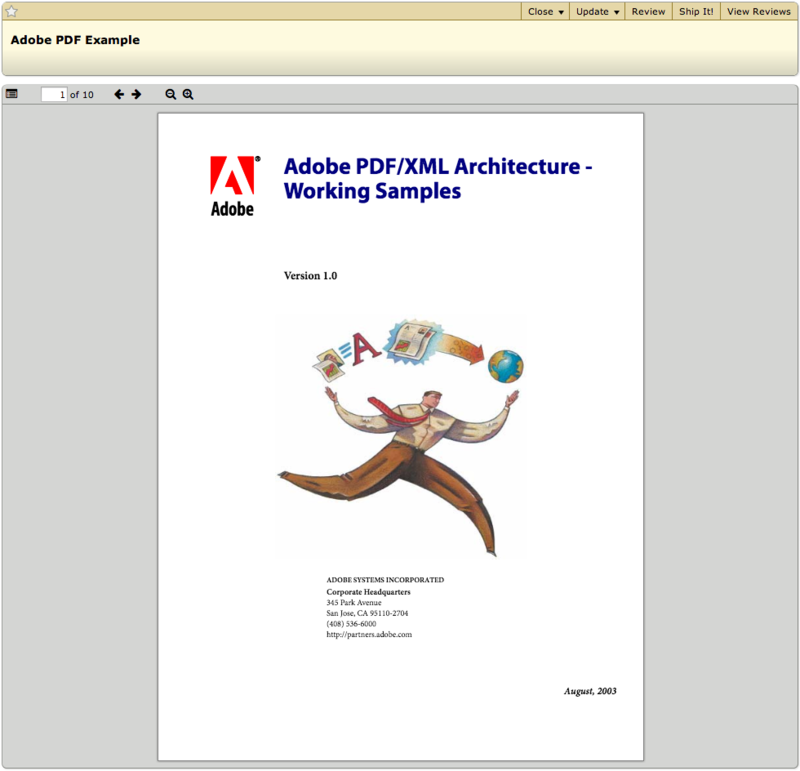 Clicking on this file will open up the PDF Review UI, which has controls to navigate the document. The file is rendered directly in the browser with no plugins (which requires a relatively modern browser). 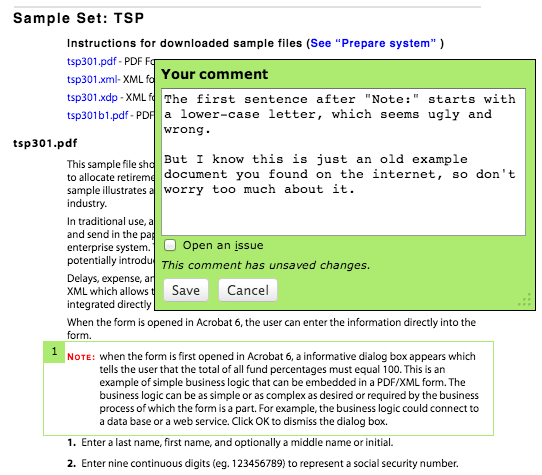 Like image review (and screenshots before it), you can add a comment to the document by clicking and dragging over the area that you’d like to talk about. When you publish, the areas that you selected will be copied into the review along with the page number on which they occurred. If you signed up for the beta program already, you should have received an email with instructions on how to install and activate this extension. If not, feel free to sign up and we’ll get in touch! That’s really nice. And I have one question about the review content, is it text based or image based? Right now, the “excerpts” that get shown in the review are images, basically screenshots of the regions that people selected. We’re investigating how we could pull out the relevant text but there are other things that are higher priority first.